We drew a collective sigh of relief over the past two weeks as we watched football on Saturdays and saw more than a few teams playing with two backs in the backfield. Now granted, we can’t get to all of the high school football games across the country but we can attest that college football has definitely understood the value of the two back formations as a changeup if nothing else. Of course the NFL has always relied heavily on the two back formations as a way to keep the chains moving in a league where yardage is extremely hard to come by. 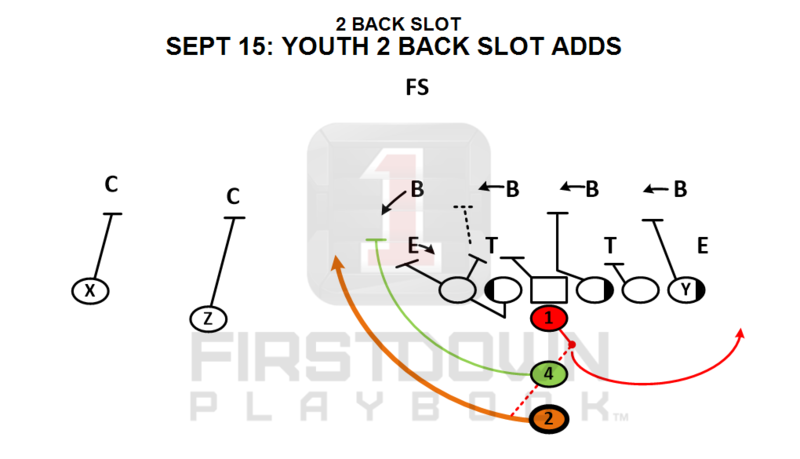 The relief we speak of was because we are spending a lot of time with the varsity and the youth football sections installing more two back run game plays in the month of September. 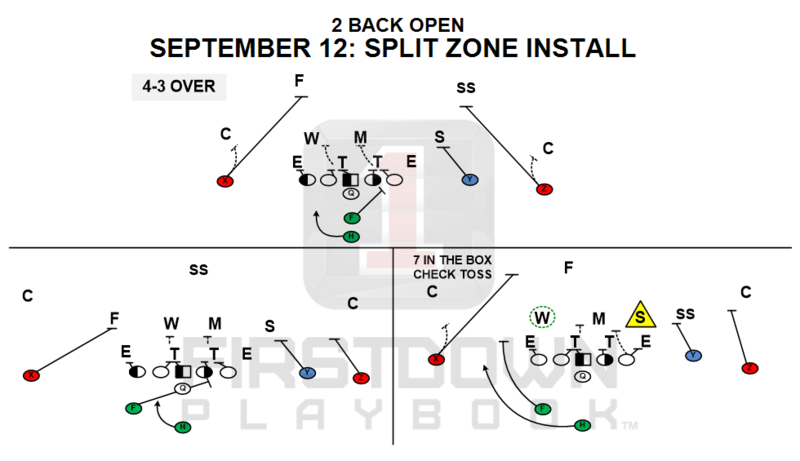 The primary emphasis at the varsity level is on your Two Back Open formation which gives you a ton of options in the run game and in the passing game. However, you do have to be aware of the short edges and the fact that if the middle of the field is closed, you have some numbers issues somewhere. 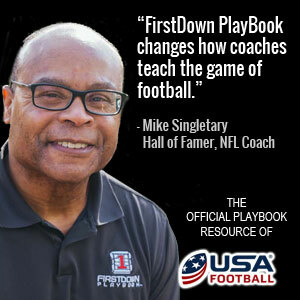 Some of that is why we install the FirstDown PlayBook run game the way we do. When you draw up all of your run game against multiple fronts and coverages, it is inevitable that some of your run game is not going to draw up as well as others. That’s why we do it. We want you to see that and make your adjustments before it happens to you in a football game. Plus, when we have the editing tool feature in January you will also be able to make your own adjustments. 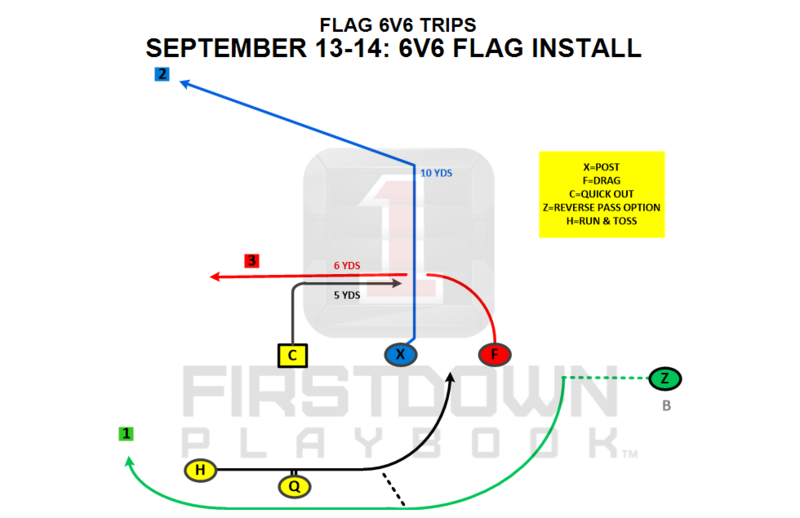 You will also notice that we are installing 6v6 flag football plays this week. The flag football arena is so vast and diverse that, we have to be honest with you, sometimes we have trouble keeping up. Yes, it’s one more case for the editing tool but we also want you to know that we are doing our research on the flag football game so that we can stay up with the trends. If you have a suggestion on how we can better supply you with flag football plays please feel free to give a shout at (512) 814-6158. We listen!